For an amateur outfit, the Fansproject guys are damn impressive. They (he?) started out with simple accessories, then add-on kits, and now they've started doing complete figures. Being a brilliant physicist, Explorer was forced to become a Weapon Engineer, when the Civil War entered into his homeland. He was assigned to be the Chief engineer in the Project "Colossus" - Combining 5 independent warriors (Unit) into one Giant Battle Machine (Colossus). The first Colossus to rollout is the Combat Unit, including 2 tank-bots, 2 helibots and the core warrior which transforms into a Guided Missile Vehicle. The Colossus System is so powerful that no A.I. can handle it. As a result in the first experiment, The Combat Unit Colossus Combination (C³) went violently out of control and destroyed half of the research facilities. C³ himself lost one of his arms and one of his legs in the incident, which resulted in the whole project to be sustained. In order to stabilize the insanity of C³'s A.I., Explorer modified himself to become one of the unit members, using his brilliant A.I. to override C³'s insanity.With the help of extra control circuit blocks, and Explorer's AI, C³ is finally controllable. As a result, Explorer becomes the leader of the Combat unit and forced to serve the army in the frontline. 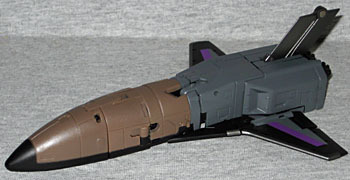 No point in beating around the bush: "Crossfire XF-02A Explorer with Combat Unit Appendage Add-On Kit Set A" is Fansproject's version of the G1 Combaticon Blast Off, and we'll be looking at him as such. He's a space shuttle unmanned drone-type Launch Vehicle, brown and grey, and 6⅜ long with a 4½" wingspan. The original toy was very stumpy, but this one is long and sleek. They've dropped the pretense of trying to make it look like a "real" shuttle - there is no windshield in the front, no boosters in the back, and no landing gear. Still, there's no mistaking what this is intended to be. It's a nice futuristic design, even if it is broken up by a lot of large seams. Fansproject has done away with the comicbook-style instruction sheets, which is a bit disappointing: the photo instructions aren't as clear as they could be. Things are mostly the same for Explorer as they were for Blast Off, like the rear of the shuttle forming the feet, or the arms coming from the nose, but it's necessarily more complex. That whole thing about Explorer being a brilliant scientist is new to the Fansproject continuity: in G1 he was cold and aloof, and though he may have certainly thought of himself as superior to all the other Decepticons, he wasn't particularly smarter. He makes for a fairly small robot, only 4⅛" tall, but Blast Off was tiny, as well. And besides, he's much more complex, what with the individual legs and arms that don't look like half a cockpit apiece. 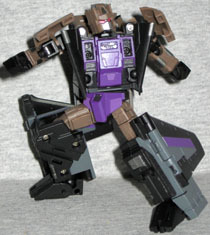 The Combaticons were "Scramble City" combiners, which meant that every limb-bot could fit in any spot. Since their heads were used as connectors, all the Scramble City bots tended to look alike, and Explorer captures that "plug" look well. He has red eyes and a silver mouthplate, and the sides of his head are straight. The head is scaled much more accurately for his body now, too - he used to be a pinhead. 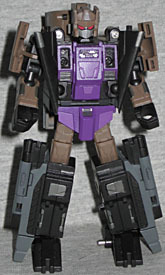 Explorer is mainly brown and black in this mode, though he's accented by purple and grey. 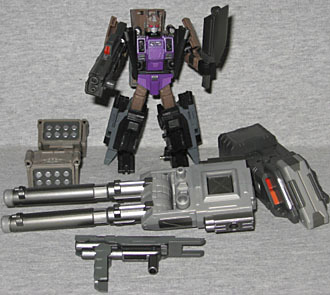 The brown is lighter than the G1 shade, but it works well. His articulation is plentiful and well-designed: he has a balljointed head, balljointed shoulders, balljointed elbows, swivel waist, balljointed hips, swivel thighs, hinged knees and balljointed ankles - that's more than a lot of "highly poseable" real TFs get! If the wing remnants on his chest get in the way, those are mounted on balljoints, as well, so you can move them to wherever you want. The detailing in the sculpt on Explorer is outstanding. You'd expect something that came out of a mold made by a fan to be at least somewhat "soft," but that's not the case here. Look at the exposed panel on his chest for instance, or touch any of the non-child-safe corners. 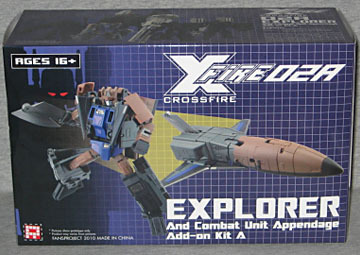 As the name "Crossfire XF-02A Explorer with Combat Unit Appendage Add-On Kit Set A" implies, Crossfire XF-02A Explorer comes with Combat Unit Appendage Add-On Kit Set A, a collection of weapons and accessories with names like "Grenade Launcher" or "Foot." Two of the weapons are specifically assigned to Explorer: the axe, which is formed from the space shuttle unmanned drone-type Launch Vehicle's tail, as well as a beam submachine gun. Like everything Fansproject makes, this release is almost painfully expensive. It's nearly $50 for a figure Hasbro would sell for $10 - yes, there are all the bonus accessories, but not $40 worth. However, if you're willing to drop the dough, Fansproject delivers.